A beautiful lion cuddly toy. A factbook all about your lion plus bookmarks and stickers too. Two exclusive magazines: WWF’s ‘Wild World’ and ‘My Tiger’ with news and updates for your adopted animal. Lions’ are super social creatures and one of the only members of the cat family that hunts in packs. They also like to hang out in family groups – or prides as they are known. Like most families they love to hang out in the sun catching some rays. They are very territorial and mark out their habitat by spraying urine around – don’t try that at home! There are only 30,000 – 35,000 lions in the wild. You will be helping WWF to work with local communities to stop them damaging habitat. WWF will educate them on how to use their natural resources more sustainably. The gift pack features a cuddly toy making this a perfect gift for children of all ages. Adopt a lion programmes start from as little as £3.00 a month. Like humans, male lions live for a shorter period than females. Males rarely live longer than 12 years whereby females can reach up to 16 years old. Unlike other cats, males and female lions do look very different. Male lions are known for their long manes whereas females are known for their maneless short hair. So slightly different from humans there! Lion cubs are clever little guys. They are fed by not only their own mothers, but if they are hungry they will often trick other mothers in the pride into feeding them as well. Visit one of our charity partners to find out how to a adopt a lion today. I may be one of the strongest animals around but my family and I are under threat on a daily basis. Humans are destroying our habitat which means we have nowhere to live. Also our food sources are being harmed meaning we are going hungry. Help to protect our homes so we can roar to fight another day. A small monthly donation can go a long way to increasing our population in the wild. After the tiger, the lion is the second largest big cat, whilst the majority of lions found are tawny you will find faint spots on young lions that are sometimes kept into maturity. Of all the cats only the lion is sexually dimorphic which means males and females look quite different in appearance. The male lion can weigh up to 250 kilograms and has a thick mane around its head that extends to below its chest and in between its forelegs. Whilst most manes tend to be brown in colour, this can vary between yellow and black. There are certain populations of lions that have very thin manes and some have none at all. At times though a male who finds himself injured may also end up losing his mane as well. Lions have massive shoulders and their forelimbs are very strong, they also have short powerful jaws and long sharp claws. They are muscular animals and this generates a lot of metabolic heat which means a lion can end up panting just by walking across an open plain. The lions roar is loud and can be heard by people nearly five miles away. Lions often climb trees as they seek to avoid herds of cape buffalo or escape biting flies. There is even one isolated group of lions on an island in Botswana’s Okavango Delta that has learned how to hunt the Cape buffalo and swims through deep rivers to get to them. The adult lion tends to be nocturnal and of all the big cats the lion is the least active. Lions are either resting or asleep for as much as 20 hours a day so a day in the life is actually quite boring! Females and males mark their territory using their scent or by roaring. A pride’s territory can cover anywhere between 15 to 400 square miles and consist of savannahs, scrub, grassy plains, dense bush or dry open woodlands. Cooperation by males and females in defending their territory is thought to explain why lions live in groups; their high density requires control over good habitats. After a male takes over a pride it will often kill existing cubs and when the female comes into estrus will sire its own cubs. Lionesses tend to prefer giving birth away from the group in a secluded area and will introduce the new born cubs to the rest of the pride when they are about eight weeks old. More often than not several females will give birth at approximately the same time and females tend to share the duties of protecting and raising the cubs in a communal nursery called a crèche. Some females will even on occasion nurse cubs that are not their own. 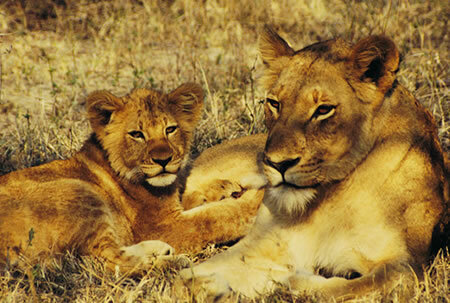 Lion cubs are vulnerable to other predators. 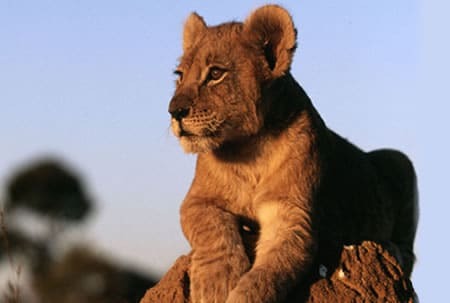 Predation combined with food shortages and attacks by other lions taking over prides means that 60 to 70 per cent of all lion cubs die before they are two years old. Lionesses will sometimes leave the pride with cubs to protect them until the age of 2 years and some die defending their cubs. Lions tend to hunt at night time or in the very early dawn. Most of the hunting is done by females who work together to ambush prey. Lions can be opportunistic and steal kills from other predators such as cheetahs, hyenas, leopards, wild dogs and at times even other lions. Scavenged food accounts for more than 50 per cent of a lion’s diet. Typical prey for a lion includes zebras, antelopes giraffe, impala, wildebeest, rhinos, wild hogs and hippos. When food is scarce the lion has been known to even attack elephants. Lions are actually pretty poor hunters which means they eat perhaps once every two or three days and can eat close to 80 pounds of meat at a single feeding. If it is available lions will drink water daily, but can go for four to five days without drinking water. Lion’s sleep for up to 20 hours each day. When a lion walks its heels never touch the ground. You can tell a male lion’s age by looking at its mane, the darker the mane the older the lion. Whilst the lion is known as the “king of the jungle” in actual fact it lives in plains and grasslands. The expression has its origin in the incorrect association between jungles and Africa. For short distances the lion can run as fast as 50 mph and can leap as far as 36 feet. Amongst the big cats, the lion is the most social and whilst we are not aware of the exact numbers of lions left in the wild, it is estimated to be around 30 – 100,000. Despite intense efforts at conservation, lion numbers are in decline throughout their habitats, which can be attributed to human activities. The African lion is in danger, it is estimated that the number of wild lions is less than 100,000 some scientists reckon the real number is 23,000. Over the last 30 years the lion population has declined by at least 48.5 per cent. Those lions that are left no longer have much of their home land. The African lion roams in less than 25 per cent of its historic range. Until recently international concern regarding lion conservation has been nonexistent. The steady decline has been largely ignored and popular conception was that lion numbers were robust. Prior to very recently no agency or nation examined the primary threats such as human lion conflict that results in habitat loss, retaliatory killings, loss of pretty, disease and an unsustainable international trade in lions and lion parts. Under the ESA the African lion has now been listed as endangered. The United States has played a big part in the disappearance of the African lion. As populations have fallen the number of lions that have been hunted for sport imported into the United States has dramatically increased. 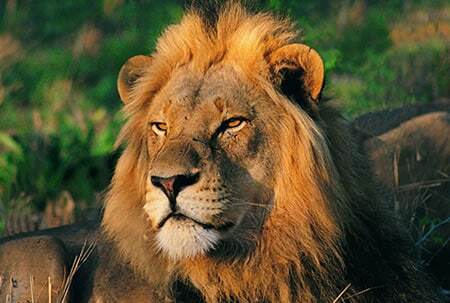 Between 1998 and 2008 recreational hunters traded 7,090 lion trophies internationally. Most of the trophies were imported into the U.S. During the same time period 2,175 lions and their body parts were also traded for commercial purposes internationally. The U.S imported 63 per cent of these specimens. Lions are the most social and best studied of the large cats and mankind has regarded these great predators with awe for thousands of years. However, despite their strength and today’s conservation efforts, lions are in decline throughout their ranges, for they do not mix well with the many human activities which threaten their livelihood. Humans are the main reason for lion decline, with large areas of the lions range appropriated for cultivation or for human habitation. When that happens there is no place for lions or the wild prey on which they depend, and the species rapidly disappears. Absolute numbers are unknown, but the world’s lion population at the present time is estimated between 30,000 and 100,000 animals. They are most widespread and abundant in Kenya, Tanzania, Ethiopia, central African Republic, Zaire, Zambia and Botswana. Elsewhere, lion populations are sparse and largely restricted to protected areas. The asiatic lion however is hanging on by a thread. Its only wild population in the world is in the Gir Forest in north-west India, where there are approx 300 of them, as many as their sanctuary can hold. By adopting a lion you are helping to support the work of conservation groups, providing vital funding necessary to carry out their campaigning and efforts to improve and preserve the wildlife and their habitat. 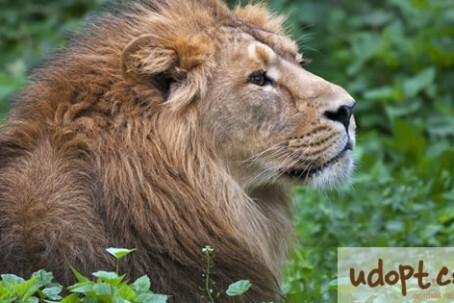 Help to make a difference in the future survival of the animals and adopt a lion today.